The title doesn't mean that my mom invented this recipe or anything like that, because she probably got it from a colleague at work many years ago. But she gave it to me and she taught me how to prepare it... my first pie ever! 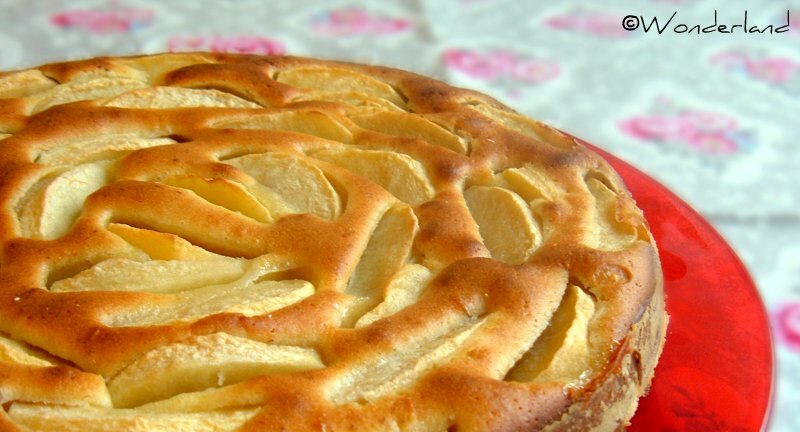 This apple pie is really easy to make and it tastes great. It's so true that "the simplest food is also the best". You can find many measurement converter charts online, like here and here, as well as on the side colum of the blog. HINT: Add two teaspoons of cinnamon powder to the dough and the pie will be even more delicious! Peel the apples, remove the seeds and cut them in thin slices. Melt the butter slowly on the stove at low heat. Put the flour in a bowl with eggs, sugar and mix well while pouring half glass of milk. When the butter is melted add it to the mixture. Mix the dry yeast with the remaining milk with a teaspoon and pour that too in the bowl. Mix well until the mixture is even. Grease a pie plate with some butter and spread some flour on it. Pour the mixture in the plate and add the apple slices on top. Bake in pre-heated oven at 200º C (392º F) for about 30 minutes. Check by inserting a toothpick in the middle, if it comes out clean, then the pie is ready. Serve as it is or with vanilla whipped cream/ice-cream.